It's frustrating to toss a load of damp clothing into the dryer only to return to find them as wet as when you put them in. The reason clothes are still wet at the end of a drying cycle might be as simple as a clogged vent. 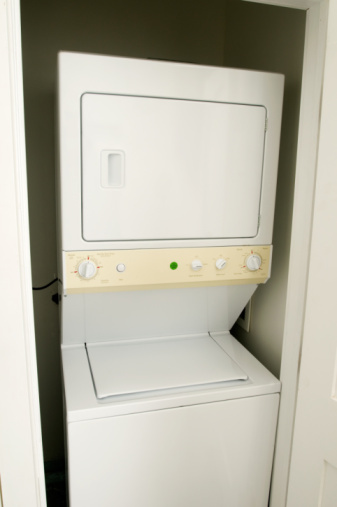 A clogged dryer vent often is the reason for damp clothes at the end of a drying cycle. One of the most prevalent and easy-to-solve – but also hazardous -- issues with a malfunctioning clothes dryer is the vent. Dryer vents get clogged with lint, bird's nests and outdoor debris, cutting of the dryer's ability to vent damp air. A typical load of laundry vents about 1 gallon of moisture, notes the Virtual Repairman website, so keeping the vent clear is imperative for the efficiency of your dryer, as well as the safety of your home. A dryer vent filled with lint is the top cause of household fires. On an electric or gas dryer there sometimes is a heat-sensing thermal fuse, which can blow if the dryer overheats. This fuse cannot be reset. Instead, you need to replace it. The internal duct work in a dryer can get clogged, just like the vent, and should be cleaned by a repair technician. In an electric dryer, the heating element – a long coil of wire -- can go bad. If your dryer is tumbling and the vent is clean, there's a good chance the heating element has burned out and needs replacing. Also, the dryer's thermostat can go bad, telling the dryer that it's hotter than it really is. Gas dryers employ an igniter to light the gas as it comes out of the valve. If the igniter malfunctions, the dryer will tumble but will not heat. What Is the Danger of Running a Dryer Not Vented Outside?